Royal Feast Video Slot Review - Casino Answers! 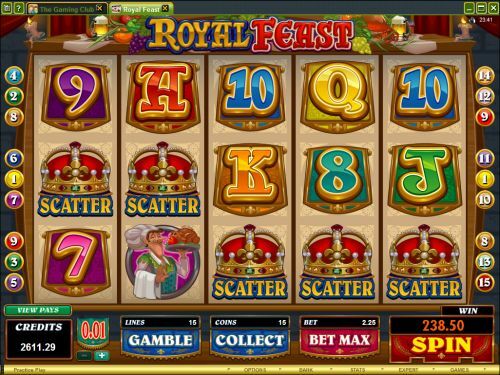 Royal Feast is a 5-reel, 15-line video slot developed by Microgaming, featuring a wild symbol, scatter wins, a free spins feature and a gamble feature. You can play the Royal Feast video slot at Bovada. Coin sizes on the Royal Feast slot machine include $0.01, $0.02, $0.05, $0.10, $0.20 and $0.25. You can select up to 15 paylines at up to 20 coins per payline. You can bet anywhere from a penny per spin up to the maximum total bet of $75 per spin on the Royal Feast slot game. Royal Feast has a decent betting range that is suitable for most online casino players. You can manually stop the reels by activating the skill stop feature in mid-spin. To play Royal Feast, select your bet and press “Spin” or simply use the “Bet Max” button to play all 15 lines at 20 coins per line. The top paying symbol on the Royal Feast slot machine is the Royal Feast symbol. If 5 of a Kind appear on an active payline, you will win the 5000 coin top jackpot. The Royal Feast symbol is wild and will substitute for all symbols except for the Scattered Crown symbol. 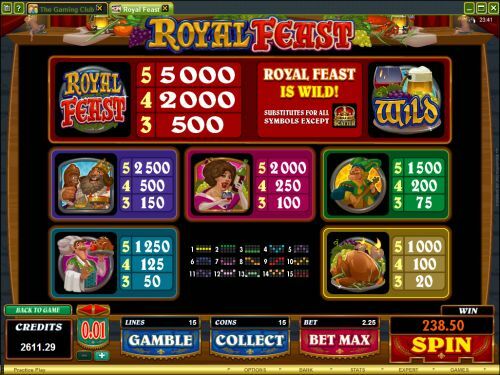 Other high paying symbols on the Royal Feast video slot include the King (2500 coins), Queen (2000 coins), Jester (1500 coins), Chef (1250 coins) and Turkey (1000 coins) symbols. With this many high paying symbols, you can definitely have a royal feast by hitting one of these amazing jackpots at Bovada! The scatter symbol is the Crown symbol. 2 or more Scattered Crowns will award a scatter payout. You can win up to 15X your total bet by hitting 5 Scattered Crowns from left to right on the reels of the Royal Feast slot machine. When two or more Scattered Crowns appear from left to right, you will win 5 free spins. Reels with scatter symbols on them will be held. During the free spins feature, additional scatter wins are held which restarts the free spins feature. When all 5 scatter wins are held, you will win 15X your total bet 5 times. Scatters pay any during free spins, rather than from left to right. Click the “Gamble” button to gamble your win on the Royal Feast video slot. You may continue to use the gamble feature until the gamble limit is reached. You must guess whether the facedown card will be red or black. Guess correctly and your winnings will be doubled. Exit the gamble feature and save your winnings by pressing the “Collect” button. To use the autoplay mode on the Royal Feast online slot machine, you must hit the “Expert” button. You can now play 5 or 10 autoplay spins. For advanced settings, hit the “AutoPlay” button and you can now play 5, 10, 25, 50, 100, 250 or 500 autoplay spins and stop autoplay if a win exceeds or equals $100, $500, $1000, $5000 or $9999. Autoplay will stop on any feature contained in the game. You can stop autoplay at any time. Royal Feast is a very solid video slot with an exceptional free spins feature. The theme’s execution is very well done as well. It doesn’t go overboard with bells and whistles, but remains interesting and fun to play. You can play the Royal Feast video slot when you sign up and make a deposit today at Microgaming casinos such as Bovada! Where can USA players play the Royal Feast slot game for real money? Unfortunately, players from the United States cannot play the Royal Feast video slot at this time. For a great selection of USA-friendly slot machines, please visit Bodog Casino.